This website has been designed to open horse owners eyes to the world of Applied Equine Podiatry, which was founded and is taught by KC La Pierre at the Institute of Applied Equine Podiatry. Do you have problems and questions regarding your horse's feet that you have never had satisfactory results or answers to, Does your horse have foot related problems? 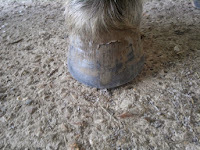 Have you ever questioned what you have been told about your horse's feet? You may have tried every other avenue and are not sure where to turn next. On navigating this website we hope it will help you to make an informed decision on whether to go shoeless and aid you in finding a hoofcare program that will suit you and your horse. We hope you enjoy our website, Do not hesitate to e-mail or give me a call with any questions or queries.